Come to Tremont ACE Hardware for all of your fuel needs. We carry wood pellets, Enviro Bricks, seasoned and kiln dried firewood, propane, and kerosene. Pellets are sold by the bag, or by the pallet. Local delivery is available for a service charge, please contact our store to see how we can help you! Enviro-Brick pressed sawdust fireplace fuel, is an effective alternative to other fuels such as fuel oil and pallet coal. Unlike coal and other fossil fuels that extract CO2 from the ground and deposit it into the atmosphere when burnt, Enviro-Bricks are made from sawdust and are considered CO2 neutral. because the trees they are manufactured from extract more CO2 from the atmosphere than the logs emit when burnt for heat. As a matter of fact, Enviro-Bricks produce 52% less particulate matter to the atmosphere than cordwood. Enviro-Bricks are twice the density of cordwood and about the same energy density as coal with burn times significantly longer than cordwood. We sell them by the pack(6 bricks per pk) or by the pallet (96 packs). Delivery is available for additional charge. 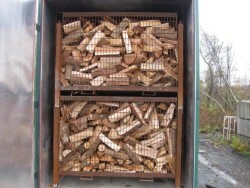 We sell firewood by the bundle, section, bag, face cord and full cord. Delivery is available for additional charge. 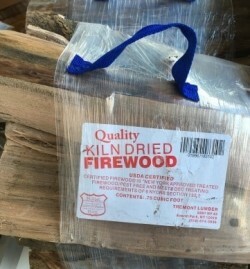 Our kiln dried wood is EPA certified and can be used in NYS campsites. We sell propane by the gallon or pound and can fill 20, 30, 40, or 100 lb tanks or RV tanks. Propane tanks can also be purchased from us.